Regarding civil works, we have extensive experience in conducting new construction in commercial premises and buildings, as well as reforms in large establishments and hypermarkets (including flooring replacement, drywall partition walls, building walls and roofs, installations of all kinds and general finishes). 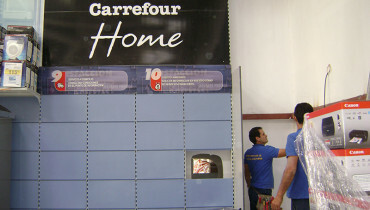 Refurbishment and expansion of Carrefour hypermarket in the Atlantico mall at Vecindario. Electrical trunking (including placement of sidewalk and asphalt pavement) and installations undertaken in Las Palmas de Gran Canaria and Santa Lucía de Tirajana municipalities, for companies like Aguiar Ltd and Joyerías Grimaldi. Overall refurbishment of 12 butcher’s shops for Juan Santana Perera Group. Electrical installation in 30 office units at El Mirador mall in Jinamar. Industrial warehouse conditioning: partition walls, floors, low voltage intallations, telecommunications, at the FLORETTE vegetables processing plant, at the Industrial estate Las Majoreras. Low voltage installations in 20 bank branches of BBVA Group in Tenerife. Electrical low voltage installation for an egg processing industry warehouse, at Granadillar, in San José del Alamo. Electrical low voltage installation in offices units and industrial buildings for ARIMOTOR (NISSAN) in Tenerife. Low voltage wiring reconditioning of all public areas (including linking installations, electric meters centralization, engine rooms, etc.) at the 240 apartments complex called Aloe in Playa del Inglés. Low voltage wiring reconditioning of all public areas (including linking installations, electric meters centralization, engine rooms, etc.) at EUROPA II building in Las Palmas GC. Replacing a 630 kVA transformer plant with a 1000 kVA one for a Jucarne’s industrial warehouse. Numerous installations for individual housing facilities, residential buildings, commercial buildings, agricultural facilities, etc. General refurbishment for Mutua Maz offices in Las Palmas de Gran Canaria. Building a 2 Km. paved sidewalk for a tram line construction in Lilienthal, Bremen, Germany. Low voltage electrical installation in commercial premises and industrial buildings for ARIMOTOR (NISSAN) Tenerife.